As Matisse became less fauve and more the artist we love, he began to depict fabrics that joyously overwhelm all other subject matter. He painted images of : tablecloths, exotic costumes worn by otherwise depersonalized women, wall hangings. And, by shifting slightly to see that it was not the cloth itself that interested him but the patterns, then wallpaper too is a subject. Because we suddenly have access to the fabrics that the artist collected over the years, the fabrics rather than the patterns are emphasized in “Matisse: The Fabric of Dreams — His Art and His Textiles” (Metropolitan Museum of Art, 1000 Fifth Avenue at 82nd Street, to September 25, 2005).Cloth is physical; patterns are conceptual. The fabrics are the embodiment of patterns, most often floral in Matisse’s fabric library. What this has to do with dreams is beyond me. Do patterns equal the Exotic Feminine and the non-European — and therefore equal dreamy Orientalism and sexism? More important, why did Matisse turn to patterning? I think there was more involved than merely that he came from a family of weavers. I ask this question because it is obvious that the history or origin of his fabrics meant little or nothing to him; high art or low art, they were all the same. This jumble of sources helped him create the flatness of his paintings. Not an artist with a high degree of toleration for emptiness, they allowed him to fill in the blanks. We know that patterned fabrics are two-dimensional, the patterns themselves usually not very illusionistic. What is the depth of a printed rose, an hibiscus, a ribbon, a bouquet or even a minilandscape? The space of patterning is the meeting place of your thumb and your forefinger when, tip-to-tip, they are brought together; it is all surface. 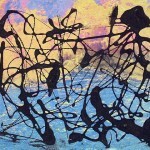 In real life, the patterning space is tactile; in paintings it is optical. Matisse used images of patterned fabrics as excuses for color and, oddly enough, when juxtaposing patterns, to create space. The first room in the exhibition is the best in terms of the exhibition theme. We see the cheaply printed, indigo dye-resist tablecloth up on the wall, a little worse for wear, near the magnificent Still Life with Blue Tablecloth, and then the much smaller The Guitarist and Pansies, where our sad piece of fabric — miraculously transformed — makes other appearances. Although the degrees of precision and the tonalities change from painting to painting, as required by the orchestration of the forms, the cloth is inadvertently glamorized and eternalized. Fabrics are to Matisse as apples were to Cézanne. The difference is that Matisse opens and widens the focus of our gaze, whereas Cézanne his elder, and the elder of us all, kept his surrogate saints and holy figures stage-center. In Matisse there are no saints. Then in the next room there is a wall of fabrics, which, if it were dated 1977, might be mistaken for a Patterning and Decoration assemblage. One assumes the curatorial staff wanted to show a goodly proportion of the fabrics Matisse had collected without the Cartesian need to match each one with a paintings. This accomplished, we move into the dreaded Nice period. Matisse was not particularly good at situating a figure in space; the Nice paintings of 1920 (e.g., Figure on Ornamental Background, etc.) show this. Only, in the ’30s, when he flattened his women to match the patterned bolts of cloth (Red Robe and Violet Tulips, etc.) did he conquer space and create a new space, owing a bit to Cubism, but nothing to the Renaissance. It is here that my mind wanders. How can I admire both Matisse and Duchamp? One artist celebrates patterned fabrics and the other urinals and bicycle wheels. One is image, the other idea; one is beauty and the other thought. And I have both my desert island and my pork-or-beef argument. But before I come to my answer — you’ll find it at the very end of this essay — I stop in front of a 19th century Egyptian appliqué wall hanging. It dawns on me that this is as beautiful, as thoughtful, and as important as anything I have seen so far. However, turning a corner, we come upon the Matisse cut-outs: mature, beautiful, perfect. In his golden years Matisse figured out how to make empty space solid. Sadly, although the Matisse show is exactly the kind of exhibition museums should be doing, we hit a major problem. The label says that both Oceana, The Sky and Oceana, The Sea (1946) were inspired by the artist’s memories of a trip he took to the South Pacific in 1930. What? So where is the fabric? The weak offerings of geometric African kuta clothes, as far as I can see, have no connection to the Oceana works and the othelate cut-outs. But I know something the curator doesn’t know. I know the source. Matisse may not have had examples in his personal collection, but the source fabrics are so vivid that it is not hard to imagine that he carried them around in his head. The following is an illustration of how life and art intersect, rather than how art historians get caught in their own logic — although probably perfectly well-meaning — and their lack of information. I was recruited to keynote a conference at the University of Australia, Canberra, as part of a residency hosted by both the glass and theory departments. On the flight down, the plane stopped to refuel at Fiji. We all had to get off the plane and circle through the tiny airport, a convenient gift shop in our path, where I bought my first pareus (sarong?) neatly encased in plastic. But since the “inside” of the airport was outdoors, there was a delicious scent of tropical flowers in the humid night air: my introduction to the South Pacific. A few years latter I was invited to an Ausglass Conference in Wagga Wagga (Ausglass is an association of Australian glass artists). Wagga is inland, sheep-ranch country, and, in the local Aboriginal language means Place of Many Crows. The National Art Glass Collection is housed in the Wagga Gallery of Art. Don’t ask why. Does anyone remember the critic Gregory Battcock? His anthologies such as The New Art and Minimal Art may no longer be used in art colleges, but in the ’70s they were essential. In any case, Gregory was a great inspiration to me. Through him I learned the important principle of “art-travel triangulation.” I remember once he was a guest of some very famous Franco-Texans, and although we were flown down to Houston in a corporate jet, Gregory managed to wangle a return passage by way of Puerto Rico at no extra cost to our hosts. He, a licensed travel agent himself, had found an airline that was going from Houston to New York via San Juan. So I asked my travel agent if on my second trip to Australia I could get off the plane at Fiji and stay a few days. He answered with a question: why don’t you stop off at Tahiti instead? The stopover cost was $100, and it was all on my own dime, so I wouldn’t have to tell some committee that my father had once docked there as a Merchant Marine and I was looking for my half-brother so I could give him his share of inheritance; nor did I have confess that I am the last descendent of Gaugin, Melville, or Robert Louis Stevenson. So there I was in a waterfront hotel (c. 1965) on the Blvd de Pomare in Papeete, the capital of Tahiti. A few days later — before I departed by catamaran (car-carrying and equipped with TV monitors showing taped installments of The Beverly Hillbillies) to the sister island of Moorea, which would prove to have even more drag queens than Tahiti itself, but no McDonald’s in sight — I noticed a small sign on one of the older buildings, two or three numbers down from my rusty hotel. The handwritten sign was for an art gallery located in the very room that Matisse had stayed in when he visited Tahiti in 1930. I went upstairs. The art on sale was touristy, but right there at the end of the room was the ornamental balcony I remembered from a painting in my teenager’s Matisse chapbook. Posted on a wall was postcard proof. Even the view beyond the ironwork was the same: from that window I could see where the ocean liners and steamships docked, and the large tent that housed a kind of shopping mall of Tahitian craft. How long had they sold crafts there? I wondered. Probably as long as there were tourists coming to Tahiti by boat. So after skirting the waiting room for passengers headed to the Marquesas, Gauguin’s finally resting place only 800 miles away, I was introduced to the Tahitian appliqué coverlet. Several stands inside the big tent I had seen from the Matisse window featured this “women’s work,” as it is called, or tifaifai, which is pronounced tee-fah-ee-fa-ee. The appliqué hangings and/or coverlets are rather like some traditional Hawaiian quilts I know, which go back to at least 1870. But because the tifaifai are not actually quilted, the highly stylized, flat images of fruits and flowers, similarly cut out of a single piece of cloth, are particularly vivid. In spite of their Rorschach symmetry, they are so very Matisse that you cannot believe your eyes. Tahitian appliqué has been produced continuously since the late 19th century. In fact, I saw a small publication that included black-and-white photographs of local dignitaries hosting a ceremonial visit from some Westerners in front of an array of appliqué cloths. One was exactly like the one I bought: the breadfruit pattern. Since the Hawaiian quilt resulted from the marriage of tapa cloth traditions and the Western quilts brought to the Sandwich Islands by missionaries, it is likely that something similar happened in Tahiti. 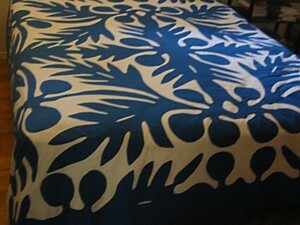 Or perhaps the Tahitian’s were directly influenced by the Hawaiian quilts? Or vice versa? 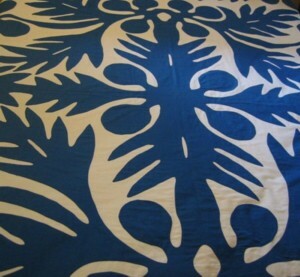 I cannot believe that Matisse did not see Tahitian appliqué in the crafts market so near his hotel, or perhaps on the bed in his room. And then once seen, how could he forget them? He didn’t. Some anthropologists and students of material culture (see George Kubler’s influential The Shape of Time) believe that the way you tell art from the other stuff is that art exhibits extremely rapid nonutilitarian changes of form. We might want to investigate this notion at some further time, but if you are willing to exclude hammers and nails from the art category, then this criterion will do as well as any other. It would seem that Tahitian appliqué has not changed for at least a hundred years and therefore is probably not art. If my theory that he appropriated his super-flat imagery from tifaifai is correct, Matisse did for Tahitian cut-outs what Duchamp did for plumbing. Next time: On to the Marquesas.